You're lucky that you can sleep anywhere (minus annoying beeps of course). I have the unenviable ability to never fall asleep on public transport, planes included. A near 40hr journey from Santa Monica (2 buses), LAX (1 plane), London Underground (2 tubes), Liverpool (1 train) and back home (other train + car) went without a wink of sleep! I can barely go to sleep in my own bed, let alone in an airport. urse reminds me of the first trip for VA I took that had my return trip borked (23 hour wait at JFK and 12 hours in the barely-not-a-warzone Chicago Midway airport). And after last years train commute/90 hour work weeks, I can sleep on almost any relatively stable surface. I consider sleeping anywhere anytime a super power, especially on planes. I fly business or "economy plus" to Narita and Hethrow from SFO reletively frequently, and rarely ever sleep more than an hour, if that. If I'm stuck in hyper economy on an american airline, chances are even worse. I've heard of people sleeping at airports because they are too cheap to pay for a hotel. I remember seeing a site that reviewed different airports on their effective coziness. Too funny. 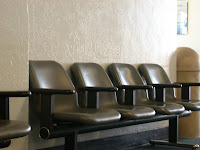 Any frequent traveler has slept in an airport at one time or another.